This was the state of Daisy Daisy yesterday at 4pm. 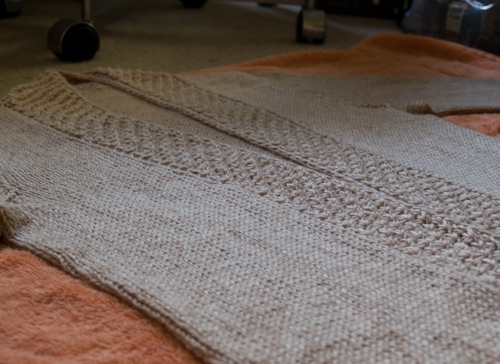 After two days of knitting, I’ve got decreases done, and enough sweater to cover me up to the ribs! I’m flying through this knit, which is only appropriate since I’m completing winging it on the design. I like a bit of waist shaping, but need the fronts to be totally clean for design reasons that will be revealed later. So I can’t use my usual scheme of placing four dart-like decreases and increases on verticals centered under the bust and correspondingly on the back. 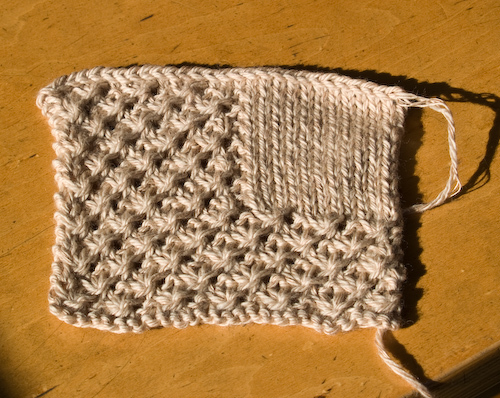 Instead I shifted all the shaping to the center back, and while I was at it, I thought I might as well make those decreases decorative. 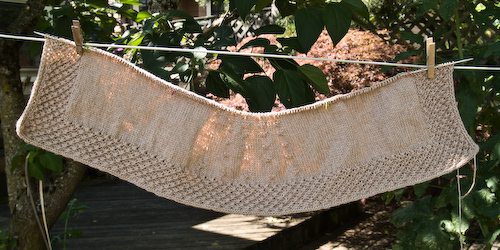 This should be easier to see when it’s blocked out, but those are 4>3 eyelet decreases engineered by Amy Detjen and featured in her Beginner’s Triangle shawl from A Gathering of Lace. I’ve unvented a corresponding decorative increase, too. I watched half the Tour stage this morning before work, and I hope the increase section will be finished by the time I’ve watched the end tonight. (Don’t tell me what happened, okay? 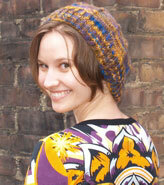 I’m scrupulously avoiding the world of cycling news, including today’s KAL thread on Ravelry, so it’ll be a surprise!) And then it’ll be time to start neckline shaping and cast on some sleeves! All is not entirely rosy, though. I’m pretty sure I don’t have enough yarn. That daisy stitch is a real yarn-guzzler, and the i-cord cast on, while I’m 100% sure it’s the right look for this jacket (I started with a couple of other cast ons and ripped them out), it used a lot of my first ball, too. So I’m hunting a sixth skein, and may have a lead via Ravelry. This yarn—it’s Louet MerLin Avalon—has been discontinued and reissued as MerLin Worsted, so while I’m pretty sure MerLin Worsted in Champagne would be an acceptable match, I haven’t found a local store selling it so I can compare the colors. Anyway, I’m going to knit until I can’t anymore, and if I have to put Daisy Daisy on hold while I wait for that last skein, I’ll just slide over into the Polka Dot jersey category and tackle some of my innumerable WIPs. And for those holding me to task on my cycling goals, I’m happy to report that I rode both days this weekend. Saturday I set out midday (after the time trial was finished; it was well worth a hotter ride to see Cancellara come scorching in 18 seconds over everyone else!) with my bike computer registering 99 degrees. I got out as far as Kelly Point and turned south, having already downed a bottle and a half of water, and then my beloved Serotta and I experienced our first mutual flat tire. 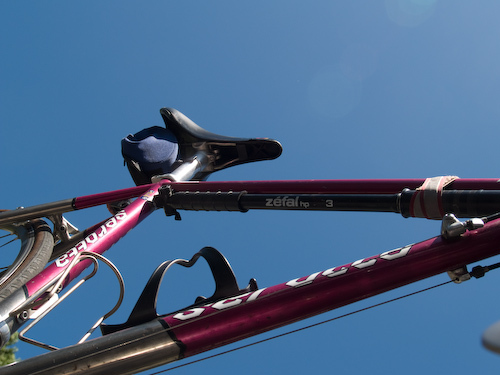 I was cruising along, and I didn’t see any patches of broken glass or anything I might have ridden through to cause a puncture, but suddenly the bike felt mushy and slithery under me and I knew exactly what had happened. I hadn’t yet assembled a patch kit to carry on this bicycle (situation amended—thanks, neighbors! ), and I’d never changed a road bike tire anyway. Luckily there was a patch of dense shade handy, and Mr. G had sent me out with his cell phone, so I called for the sag wagon and my man and our dog came to rescue me. Only about ten miles logged for that day. 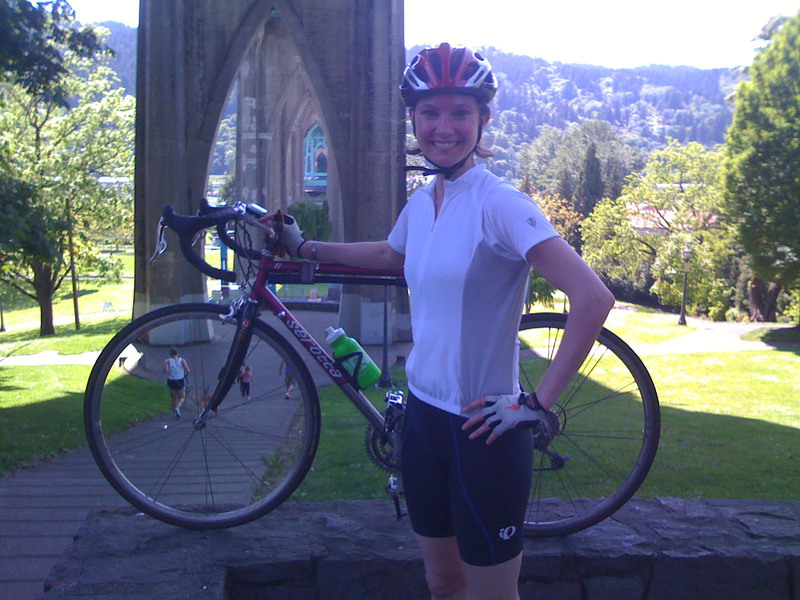 But yesterday I went out with our neighbor and did the Airport Loop and Rocky Butte—my first look at that climb. I huffed and puffed and gave it my best shot, and although I did stop once to pant and drink water, I made it to the top, and the descent was definitely worth it. I didn’t know the road and wasn’t quite brave enough not to touch my brakes at all, but I topped 60kph and loved every second of it! (Good thing my computer happened to be logging max speed… on the way down I was too busy watching the road and trying to judge my lines for the bends to think of looking at the screen!) So climbing is still my weakest point, but I’m determined that I’ll be able to pedal straight up Rocky Butte without resting by the time I have to be ready for the Tour de Cure on the 25th! I’m going to try to ride it again after work at least once this week. I’ll not marry in spite of my love for you. There won’t be any marriage. And hey, the bicycle helped get us out of corsets, ladies. If that sentiment makes you want to follow the Tour this year, it’s not too late to join the knit-along on Ravelry. Sometimes the weather really is too good to stay inside and knit, and anyway, how could I just leave this beautiful machine in the garage? Yep, that’s the Serotta Ti, and she’s one-third mine! (Happily, my neighbor is willing to accept an installment plan.) Isn’t she gorgeous, raspberry sorbet pink and all? I *heart* her. You’ll have to forgive the iPhone photo; the SLR really doesn’t fit comfortably in the back pocket of a cycling jersey. You’ll also have to forgive my glowing lobsterishness. This is about eighteen miles into the twenty-six we covered on Sunday, which is the longest I’ve ridden in quite a long time, and that’s just how my face gets. I match my bike! It was the first time I’ve seen Cathedral Park, under the St. John’s bridge—a very promising spot for picnicking above the river. We didn’t picnic, though; we were travelling light. But we did stop for tacos at Por Que No? on the way home, which made for a perfect afternoon. Evenings are being spent working on the Frost Flowers cardigan. Those of you warning me to ditch it now are probably right, but my mother would tell you I’m awfully stubborn. 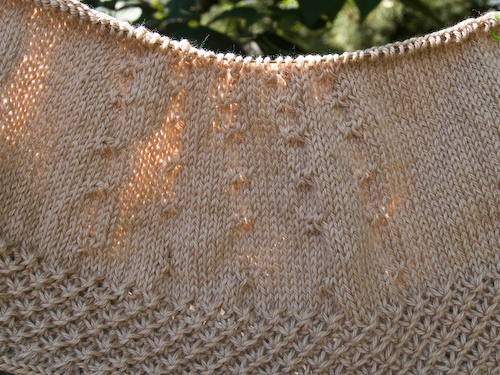 Apparently I am also optimistic to a perverse degree, because somehow I’m still holding out hope that I’ll really like this sweater when it’s finished. I’m just getting comfortable enough with the double-sided frost flowers motif that I can work on it while I watch the Giro d’Italia coverage. I’m tickled that today’s Cuneo to Pinerolo queen stage takes the peloton through the mountains where Mr. G and I travelled to see some of the Olympic skiing in 2006. The race went right through Oulx, the town we hiked and glissaded down to after the women’s freestyle was cancelled for too much snow and the buses couldn’t get back down the mountain, and through Sestriere where we saw the men’s downhill. What beautiful country it is up there. Motivation to get stronger at riding the hills!